This print is from a set entitled Verscheyden Schrynwerck als Portalen, Kleerkassen, Buffeten … engraved after a design by Paulus Vredeman de Vries. 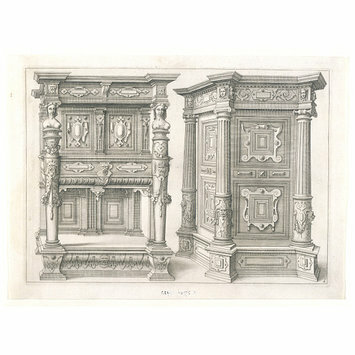 The set of designs are for woodwork, and this print shows a design for a buffet or sideboard and a cupboard. The design incorporates a female figures, drawing comparison between architecture and the human form. Ornament designs like this were copied by artisans, who copied them in the making of furniture, vases, textiles and so on, and were important in spreading the influence of various styles. 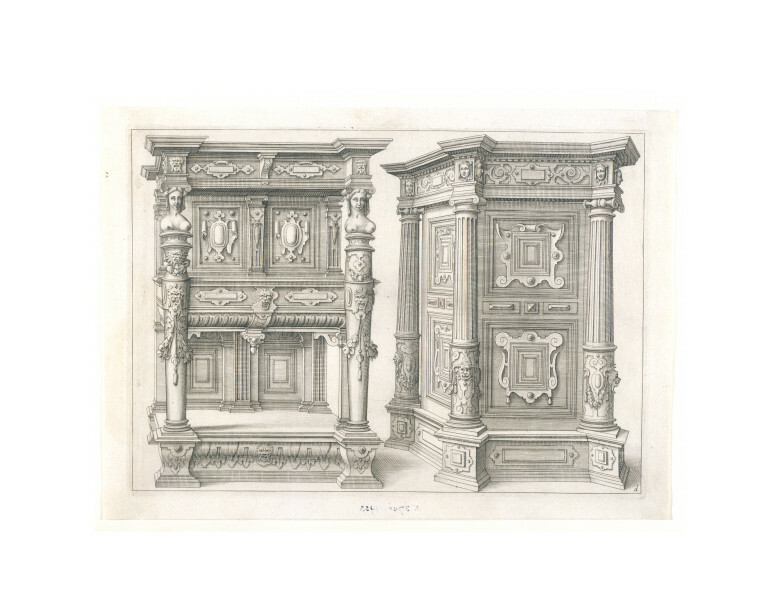 Print depicting a buffet and a cupboard, engraving, and showing mannerist variations on the classical order, here applied to furniture. Lettered 'd' in the lower left of the plate. 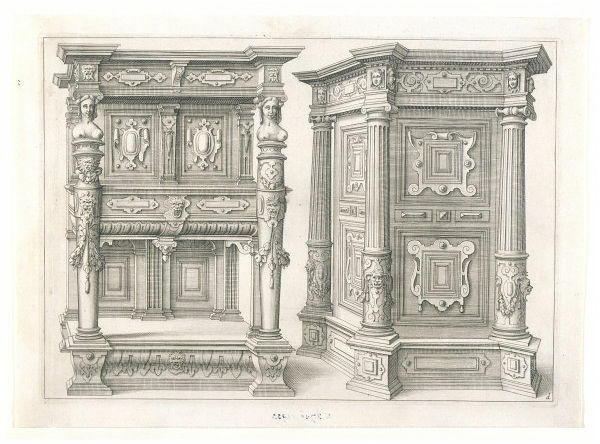 This print shows mannerist variations on the classical order, here applied to furniture. Hans Vredeman de Vries and his son Paul played a major part in bringing this type of mannerist design to northern Europe. Paulus Vredeman de Vries. 1 of 20 plates from a suite of 24 designs for furniture, including title plate, entitled 'Verscheyden Schrynwerck als Portalen...'. Dutch, 1630. Fuhring, P. Ornament prints in the Rijksmuseum II: The Seventeenthy Century, 3 vols, Rotterdam, 2004, vol. 1, 2154-2178. (Berlin II) Berlin Staatlich Museen., Katalog der Ornamentstich-Sammlung der Staatlichen Kunstbibliothek Berlin, Berlin and Leipzig, 1936-39, 1221.